What are the Advantages of Wood-Plastic Wallboard Production Line Equipment? 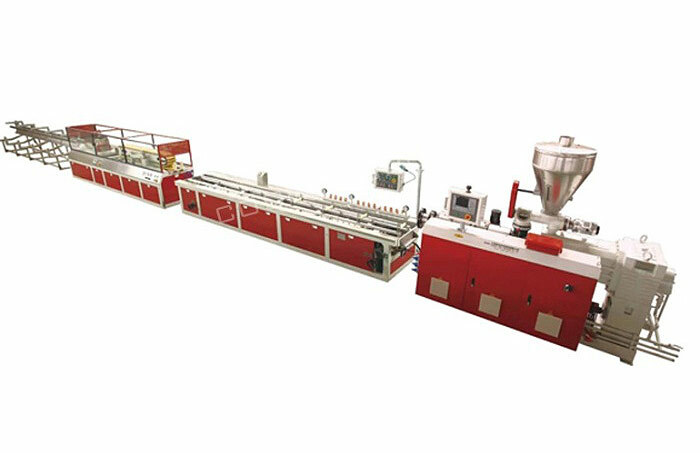 The wood-plastic wallboard production line equipment is mainly composed of a cone-type twin-screw, a mold, a vacuum type table, a tractor, a cutting machine, and a turning frame. With automatic control, high degree of automation, stable equipment, easy operation and high production efficiency. Through the replacement of different specifications of the mold can produce a variety of specifications, size, shape, thickness of wood-plastic decorative wall panels, wood-plastic wall panels, quick-install wall panels, ecological wall panels. The surface treatment of the wood-plastic wallboard production line equipment is all environmentally friendly materials. No paint components, no odor in the renovated room, no harmful ingredients, completely bid farewell to formaldehyde, and truly zero carbon zero emissions. The insulation of the products produced by the wood-plastic wallboard production line has been tested by the national authority. The room temperature difference is 7 degrees compared with the ordinary decoration materials in our product installation room. Which is 10 degrees compared with the paint. It is the best material for our southern summer hot and cold winter wall decoration. This product has unique thermal insulation properties. It can solve the direct sunlight intensity on the balcony, sun room and the top of the villa top. If the inverter air conditioner is used. It can achieve obvious energy-saving effect. It is an environmentally-friendly material recommended by the country. In the design, the traditional gusset plate installation method can be used for direct bending, folding and folding, and the blank wall can be directly installed. One step is in place, the installation is no longer cumbersome, and the ordinary woodworker can let you not worry about the decoration cycle is too long.